For more information, please email events@tourolaw.edu or call 631-761-7063. New York Continuing Legal Education rules require newly admitted attorneys to complete a minimum of 32 hours of special in-person (CLE) within the first 24 months after admission. These courses are typically designated as "Bridge the Gap" programs, since they focus on preparing attorneys with "nuts and bolts" instruction in basic practice areas. In January, Touro will once again offer its Perfect for Practice program which helps our recent grads meet their first year CLE requirement. 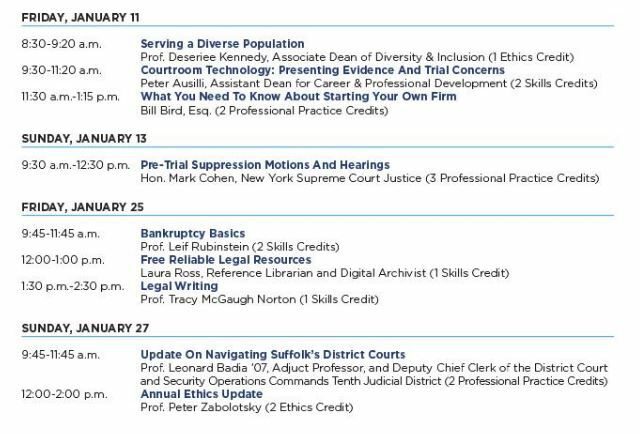 We are inviting you to participate in a complimentary CLE program taking place over four days in January. The dates are Friday, January 11th, Sunday the 13th, Friday the 25th, and Sunday the 27th. Attendance on all four days will earn 16 hours of newly admitted attorney CLE credits, which will fulfill your first year "Bridging the Gap" requirements. The entire program, including all materials, is free. It is open only to 2017 and 2018 Touro Law alumni. If these credits were to be obtained elsewhere, comparable programs would cost $200 or more. This unique program allows you to get the CLE credits you need while renewing relationships with classmates and favorite faculty members, many of whom are instructors in the program. Refreshments will be served. Walk in registration will not be available. Likewise, if you commit to attending, you are expected to attend.